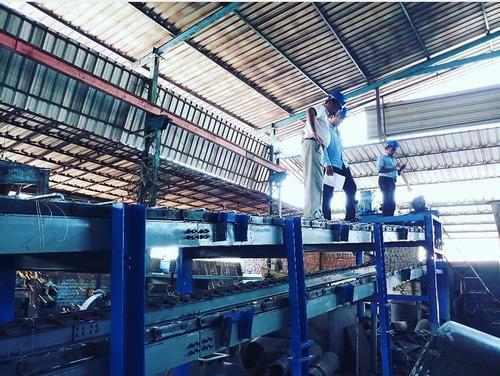 AFTER MANY RESEARCH & DEVELOPMENT AND EXPERIMENT OF ALUMINIUM INGOT CASTING CONVEYOR HAS BEEN DESIGNED BY DHANVANTI ENGINEERING. MACHINE CONVERT ALUMINIUM LIQUID METAL INTO ALUMINIUM INGOTS (5.Kg, 7.Kg & 10.Kg ALU Ingots). AFTER MANY RESEARCH & DEVELOPMENT AND EXPERIMENT OF ALUMINIUM INGOT CASTING CONVEYOR HAS BEEN DESIGNED BY DHANVANTI ENGINEERING. MACHINE CONVERT ALUMINIUM LIQUID METAL INTO ALUMINIUM INGOTS (5.Kg,7.Kg & 10.Kg ALU Ingots). We, Dhanvanti Engineering from 2006 are Manufacturers and Exporter of a high-quality range of Aluminum recycling and Alloy Plant machineries and Aluminium Dross processing machineries. Offered products range consists of Aluminium Shots machine,Aluminium Dross pulverizer, Rotary Furnaces, skelner furnace,Aluminium ingot casting Machine and Aluminium Cube Casting Machine etc. All offered products are designed using quality tested materials. The provided products are extensively appreciated amongst our customers for their durable finish standard, sturdy construction, long functional life, easy to operate and less maintenance. Due to our state-of-the-art infrastructure unit, we are providing a quality range of products. We have divided our infrastructure into different departments like procurement, manufacturing, quality control, sales and marketing, and many more. Equipment with modern machinery, this infrastructure unit helps us to manufacture these plants as per the defined quality standards. In order to carry out a smooth production process, we make required changes in our infrastructure. The entire work process is supervised by our professionals who are hired on the basis of their rich industry experience and knowledge. 105/B, Shree Krishna Estate, Opposite G. V. M. M.